Hardwood forests. Willow (Salix), maple (Acer), locust (Robinia), and speckled alder. Dead twigs and branches of hardwood trees; often in leaf litter and appearing as if growing on the ground. This common mushroom is one of the first splashes of color to be seen in early spring in eastern hardwood forests. It is found solitary or in groups on buried or fallen hardwood twigs and branches. A stalk is usually present. When present, it is up to 1½″ long, ⅛″ to ¼″ thick, minutely hairy, white and tapered, wider at the top than at the base. The length of the stalk depends on how deeply the wood on which it is growing is buried. The cap is more or less cup-shaped and ¾″ to 2¾″ wide. The upper side is bright red and hairless. It sometimes fades to reddish-orange and becomes wrinkled, especially near the center, with age. The underside is pinkish to whitish, downy, and covered with minute, elaborately twisted and curved hairs. The character of the hairs can only be seen with a microscope. The margin is curved inward and often becomes tattered with age. There is no fringe of dark hairs on the margin. The flesh is thin, rubbery, and whitish. 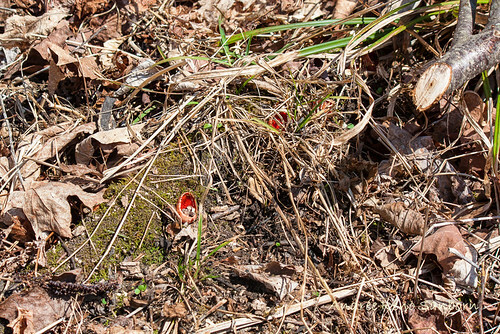 Scarlet Cup (Sarcoscypha coccinea) is identical in appearance and can only be distinguished by observing microscopic features. However, its range is restricted to California and the Pacific northwest. Sarcoscypha dudleyi (no common name) is identical in appearance and can only be distinguished by observing microscopic features. The hairs in the underside of the cap are straight or only slightly curved. Minnesota Biodiversity Atlas (Bell Museum of Natural History) and the United States National Fungus Collections (BPI) contains no records of Sarcoscypha austriaca but many records of Sarcoscypha coccinea. However, MushroomExpert.com, David Arora’s Mushrooms Demystified, and Mushrooms of Northeast North America all state that the range of the latter species is restricted to California and the Pacific northwest. The map at left includes Sarcoscypha coccinea records from the Bell Herbarium and BPI. Sarcoscypha austriaca is a species complex that includes both Sarcoscypha austriaca, Sarcoscypha coccinea, and Sarcoscypha dudleyi. The two can be distinguished only by microscopic examination of the spores. I found two today in brown county. This time, this Scarlet Elf cap Was found in Minneopa State Park, blue earth county. Sarcoscypha coccinea, commonly known as the scarlet elf cup, or the scarlet cup, is a species of fungus in the Sarcoscyphaceae family of the Pezizales order. Rode kelkzwam (Sarcoscypha coccinea). Geflimd in het Staelduinse bos in 's-Gravenzande. Twee wandelaars die mij rond zagen scharrelen met een camera gaven me de tip om te gaan kijken in de buurt van de bunkers. Dank voor de tip! If anyone has anymore info about this mushroom please share below. We took the woodland trail that is an easy hike for my 6 year old. I bet we saw close to 60 or 70 along this short trail and that was just within eye sight of the trail. It was a fun adventure trying to see who could find the biggest. On one 6 foot branch alone there were probably 20 bright scarlet cups growing.